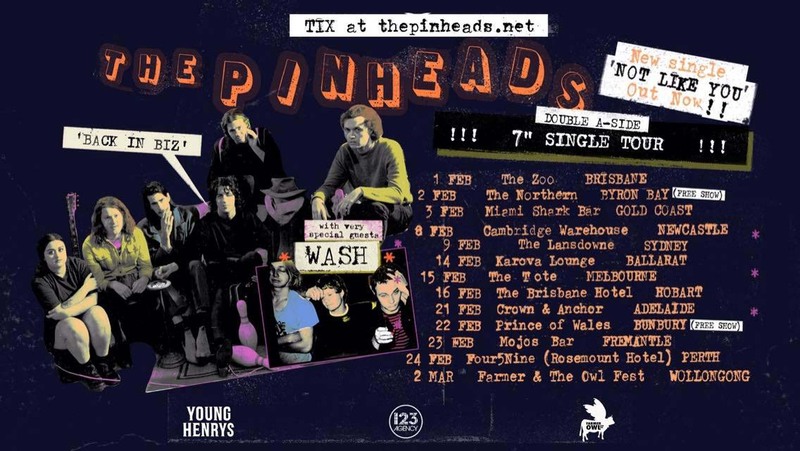 The Pinheads return from a multi member sabbatical with a new single, Not Like You, a tune about our divergent world of round the clock connection, resulting in chronic isolation, the mingling pot of personalities, untameable ego, opposing ideologies, conflicting cultural ideals and a societal anxiety timebomb threatening to blow at any second. Not Like You will be released as a limited-edition double A side, 7” vinyl on Friday 18th January. To celebrate the release, the band are heading out on a 12 date Australian tour in February 2019. A song about the pressure to squeeze into society’s frame, whilst retaining a sense of self... or not. Neatly wrapped up in a sharp, steadfast, shady, beguiling slice of pop perfection! Penned as the band boarded a plan to knock out a brutal 25 date European tour, fine-tuned in bands rooms along the way. Fans don’t leave Pinheads shows with fond memories - they leave with battle scars and folklore tales to last the ages.